Some people ask me where my energy comes from and the answer is always my morning cup of coffee. It is my favorite way to start the day, and is much more than just the caffeine. It is the experience, the warmth and those few sacred quiet moments before a busy day ahead. Keeping mornings running smoothly typically entails keeping everything in zones and corralled together. 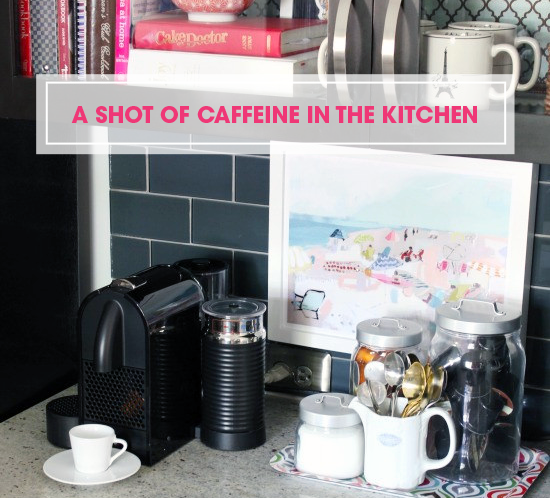 That is definitely the case when it comes to coffee stations; keeping everything together so you don't have to fumble half awake around the kitchen digging for mugs, spoons, sugars and nutmeg. 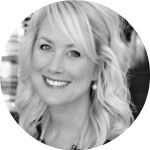 My darling friend, Cassie from Hi Sugarplum, is stopping in today to share how she kicked her coffee nook up a notch. I just love how she pulled it together and I imagine her mornings start with a smile on her face! Hey there, friends! 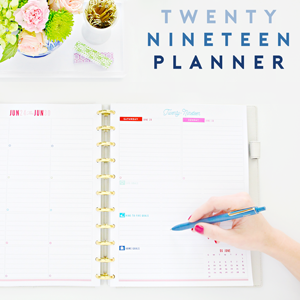 I'm thrilled to be back at Jen's, sharing my latest organizing overhaul. 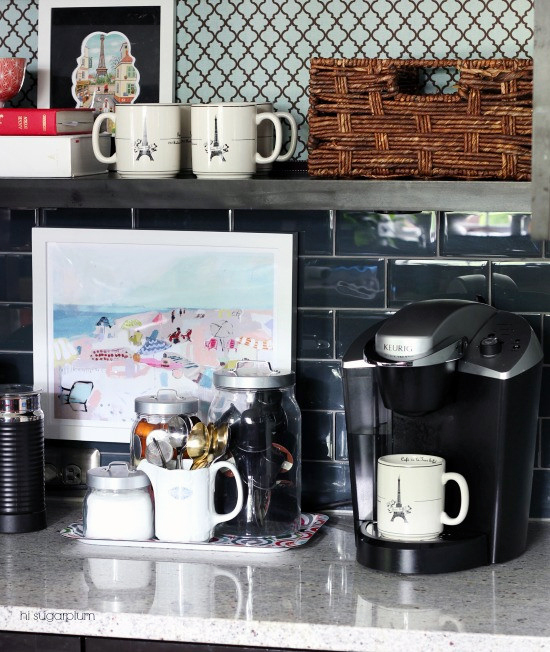 This time it's for one of the most important, life-sustaining areas of the house....the coffee station! Don't talk to me until I've had my coffee, right?! When we cleaned out the junk drawers, many of you savvy readers wondered what became of the coffee pods that used to live in those drawers. Truth was, I had to figure out a new system. And don't ask how we ended up with both a Keurig and a Nespresso machine, but now we're addicted to both, so I've had to find a way to make them, and all their accessories, work in our small kitchen. 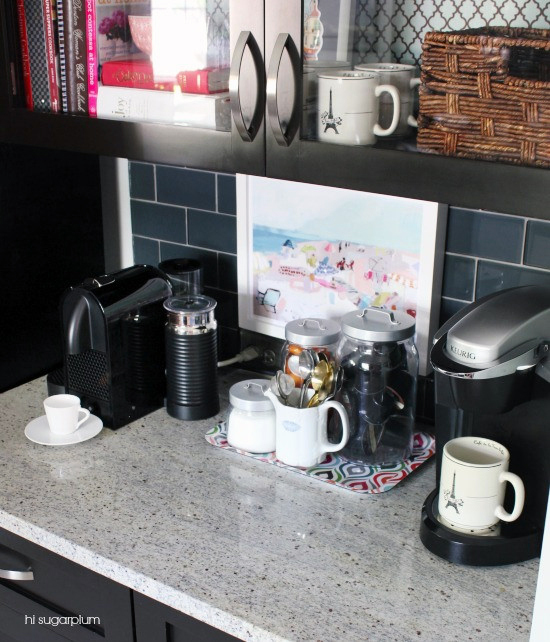 It's more efficient and convenient to keep everything together, so I dedicated the smallest section of counter space to our in-home coffee bar. 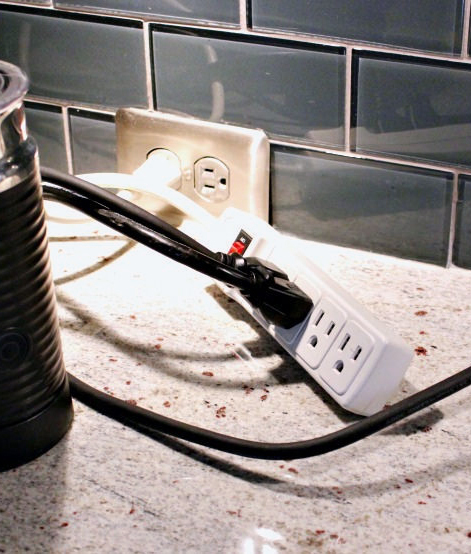 I have a thing about cords showing (see how I hide lamp cords here, and computer cords here), so my first task was to tackle the giant, industrial power cords for the two coffee machines. Instead of plugging them both in the backsplash outlet, and having a nest of cords on the counter, I plugged them in a single power strip, then dropped it, and the excess cord, behind the fridge. That also leaves me with an available outlet for the toaster or blender, when they're needed. These type of coffee machines are amazing, but the pods always seem to be a nemesis! So I grabbed a set of glass jars (mine are from Ikea), and filled the largest one with K-Cups, the medium with Nespresso pods, and the small one with sweetener. A pitcher we brought back from this trip holds spoons and a tea sieve. And the whole she-bang is corralled on a cheery tray that's easy to keep clean. 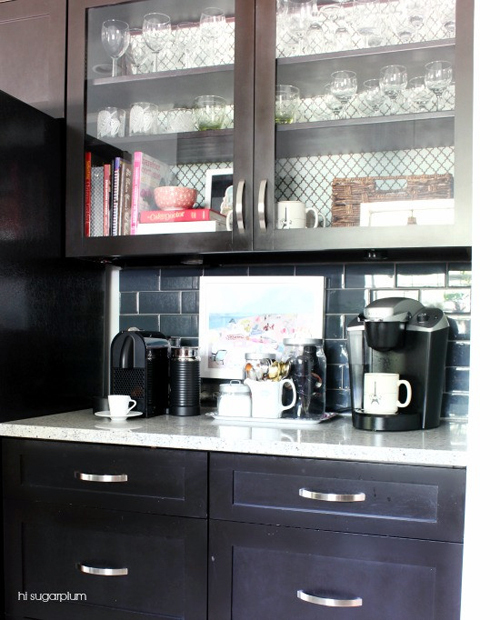 The cabinets above the coffee makers are glass, so it forces me to create clever, and chic, organization and storage. Our mugs are stacked, with the cutest ones in the front. 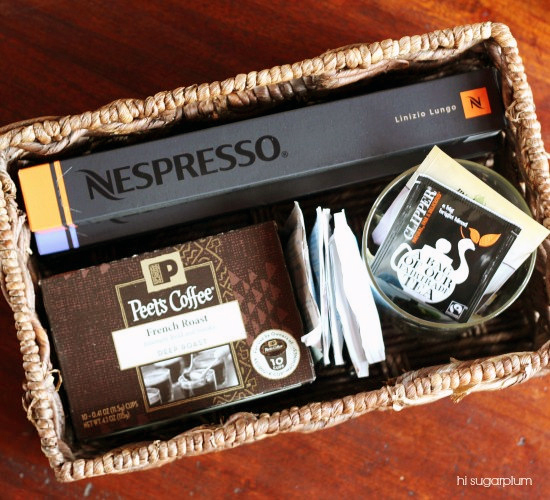 And a woven basket holds extra coffee pods, tea bags, and hot chocolate. 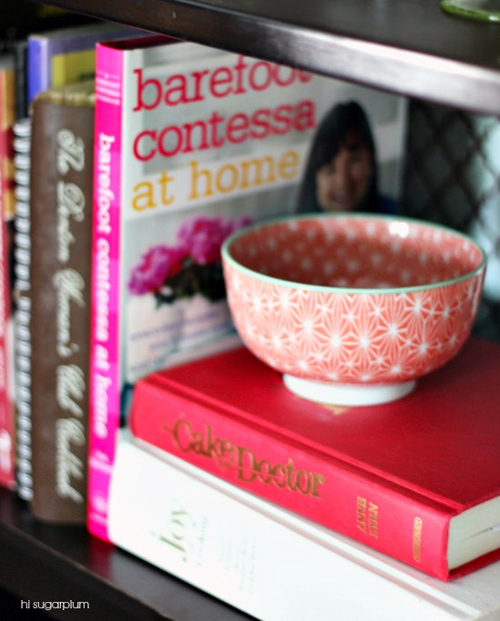 This cute bowl, stacked on the cookbooks, holds assorted sweetener packets for guests that prefer them over sugar. Everything we need to get the day started, is right at our fingertips! 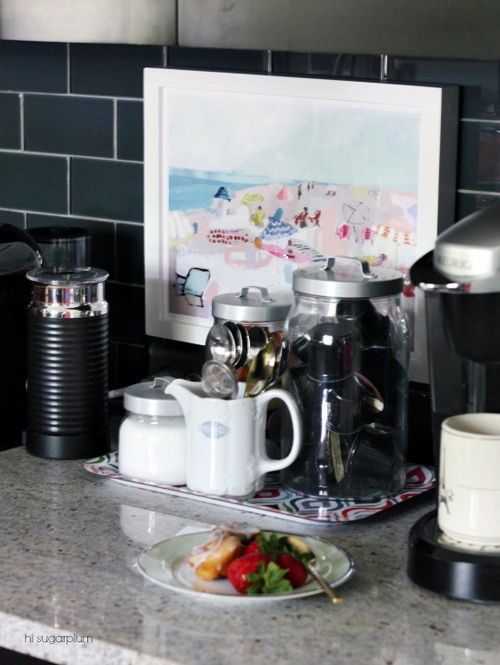 I used a Command hook to hang one of my favorite pieces of art on the backsplash...not only does it make me happy to see each morning, but it detracts from the appliances and makes the space feel more decorated. Now instead of a cluttered mess of boxes and pods, we have a happy corner for everyone to make their favorite drinks. I've been known to lovingly pet this little spot from time to time. Did things just get weird? 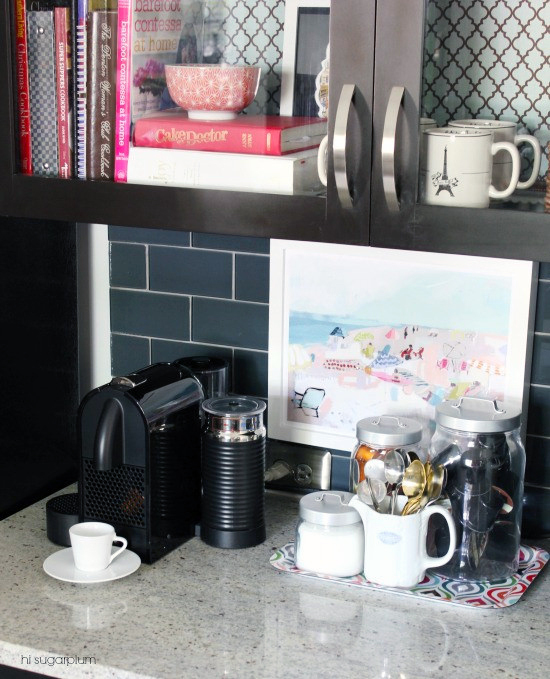 How do you tame the coffee maker clutter? 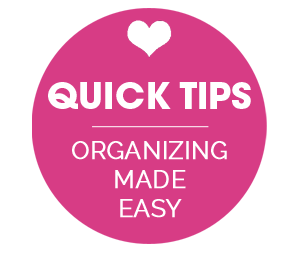 Happy organizing, lovebugs! Nepresso in my favorite. And while I know you this post is supposed to feature the organization, I was just too distracted by the Nepresso. :) Just joking. Very helpful ideas. Thank you! I just got a Nespresso but haven't ordered any pods yet. 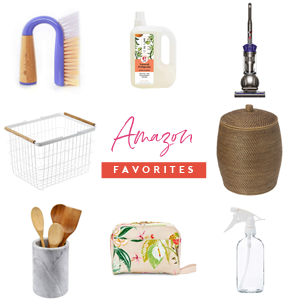 Would love some recommendations on what to order. It's a little overwhelming. So after this post I started looking at the Nespresso machines. There are so many. I am so confused. Which one do you recommend? 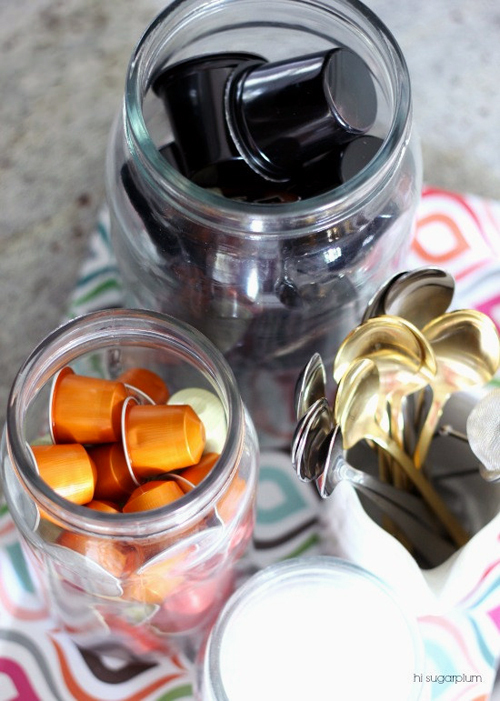 @LOvercash_1970 I love my Nespresso and my favorite pod is the Volluto. I believe that the machine comes with a sample pack, and you can find specific details about the flavor and intensity of each on their website as well. I've always struggled with having 2+ different coffee makers in my kitchen. This is a wonderful post. The way you placed everything around the machines makes all the difference. 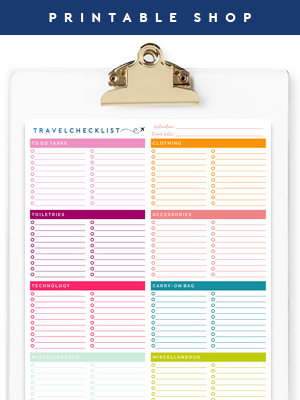 Thanks so much, Kerri...it definitely took some trial and error to get things organized and simplified! 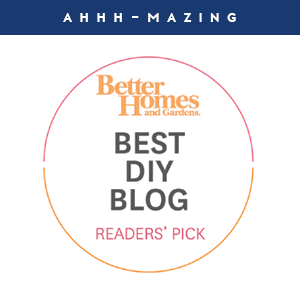 I love, LOVE this space! It reminds me of a really cool coffee joint. I love all of the colors, they mix so well together. Especially the backsplash tile! Well done, Cassie! The coffee station is styled well but I find it so wasteful to throw out a tiny plastic cup for each and every coffee you drink. These machines are enemies of the environment. Yes, we recycle our empty pods, and can usually even get another half-cup out of the same pod. I like that the Nespresso pods are so much smaller, too. I love this so much!!! 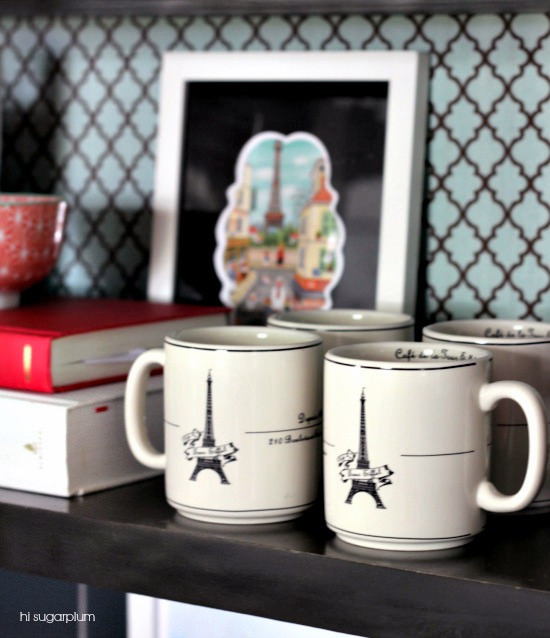 I do have to ask where did you get those super cute mugs. 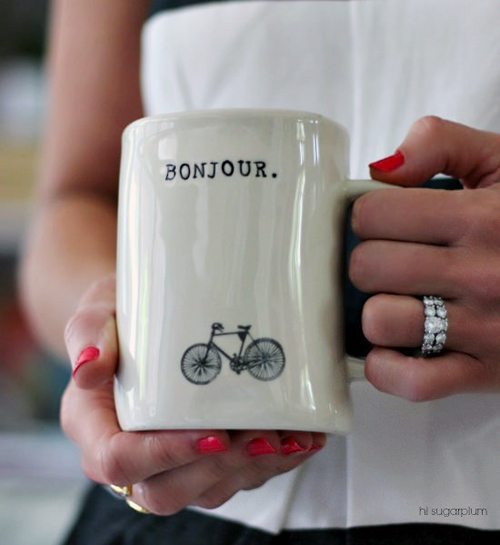 I'm constantly looking for cute mugs and am very picky. Those gold spoons were a gift, and I believe she found them at West Elm. I've heard Target carries a set too! 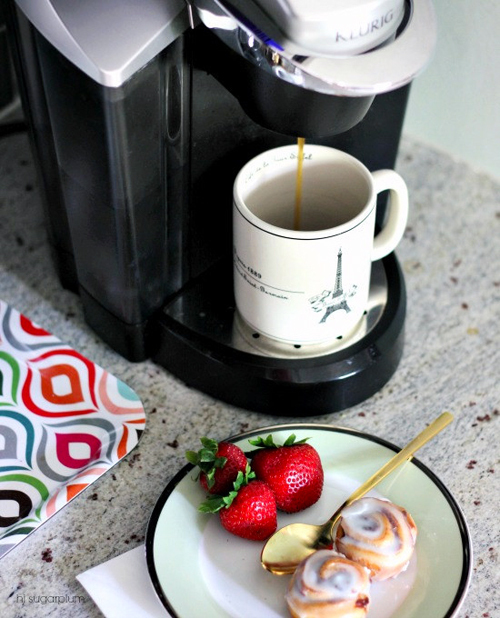 Thank you Jen for your post on Cassie's coffee station. Thank you Cassie for the idea to use a command hook to hang art at my coffee station. We recently had our 70's kitchen overhauled. I now have a lovely coffee are but it's been lacking. Would you be willing to share the back splash tile color and brand? I love it - so sophisticated. We've been looking for something similar in dark grey, but I love the navy. Great post and ideas. Thanks for sharing! Hi Abby -- we found that glass subway tile at a local tile shop, but I've seen it on Amazon before. It's Skylights brand, and it's a smoky gray/blue. Hope this helps! Can we just talk about that beautiful diamond ring? Little green monster poking his head out! 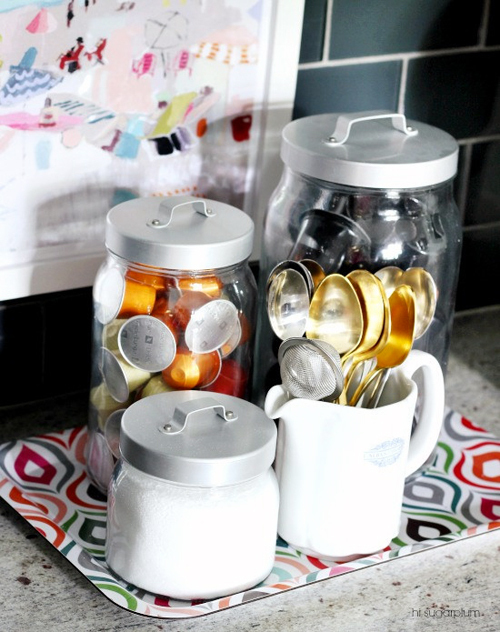 Going to Ikea on Monday and am definitely going to go look for those jars! I feel like I have k-cups tucked all over my kitchen. Fellow Texan here, loving your space! Would you be willing to share where the artwork came from? Our four-year-old pink-loving daughter loved our trip to the beach this year, and I think this print would look perfect with her seashell collection in her light blue bathroom. Thanks Elizabeth!! The art is by Teil Duncan. I found it online at Furbish, but I'm sure Teil sells it directly from her site as well! Hope this helps! This is such an amazing area! It would surely make me happy in the morning!